In 2006, ahead of nationwide Immigration Reform rallies, a Spanish version of The Star-Spangled Banner was released by Wyclef Jean, Olga Tañon, Pitbull, Ivy Queen, Gloria Trevi, Aventura, Tito “El Bambino”, and Carlos Ponce. There was quite a bit of controversy surrounding the song called “Nuestro Himno” and I, like many others, mistakenly thought that this was the first time the national anthem of the United States had been translated to Spanish. 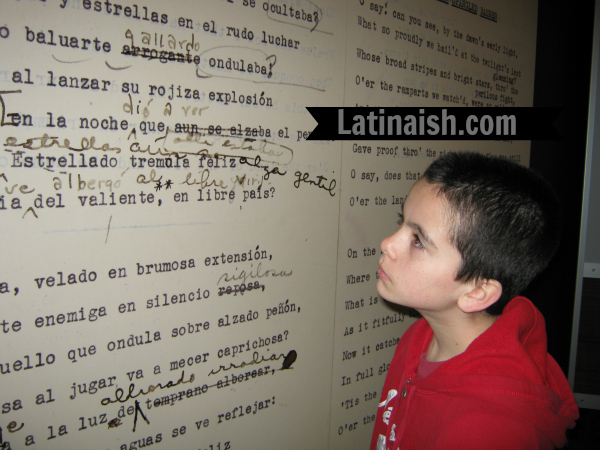 I learned on a recent trip to The National Museum of American History in Washington, D.C., that The Star-Spangled Banner was actually translated by Peruvian immigrant, Clotilde Arias in 1946, commissioned by the U.S. government under President Franklin D. Roosevelt’s “Good Neighbor Policy” – an effort to win allies in Latin America after World War II. The original manuscript for “El Pendón Estrellado” is featured in the museum along with the fascinating life history of Arias. As I walked throughout the exhibit, I just kept thinking, how interesting it is that we choose role models from our limited knowledge of people both living and dead, when in reality there are so many amazing but little known people in history like Clotilde Arias who we can relate to and be inspired by. Here I’ll share some of the exhibit but for those who live in the D.C. area, I encourage you to make a visit in person – there is plenty more to see. Clotilde Arias was born in Iquitos, Peru in 1901, but it’s her life in the United States which I related to, (and I think many other women will, too.) Here is an excerpt of text which I read on the wall of the exhibit. “Clotilde Arias arrived in New York City in 1923…Arias intended to study music. In 1929 she married José Anduaga, a Peruvian artist and designer from Iquitos whom she met in New York and with whom she had a son, Roger. They lived in 267 Park Street in Brooklyn. In many of her personal papers she described how difficult life was and how she had to abandon her studies to help support the family. Arias mastered multitasking at a time when women commonly did not work outside the home. Throughout her life she wore many hats: translator, composer, musician, journalist, copywriter, activist, educator, and of course, mother. She was sometimes all of them at the same time.” – National Museum of American History, Washington, D.C. I must have stood there and read that at least three times. Clotilde felt so real in that moment because juggling all these hats is a frequent topic of discussion among women today. I really felt like you could take Clotilde Arias out of history and plunk her down in the social circles I run in, amongst my group of Latina bloguera friends especially, and she would fit right in. 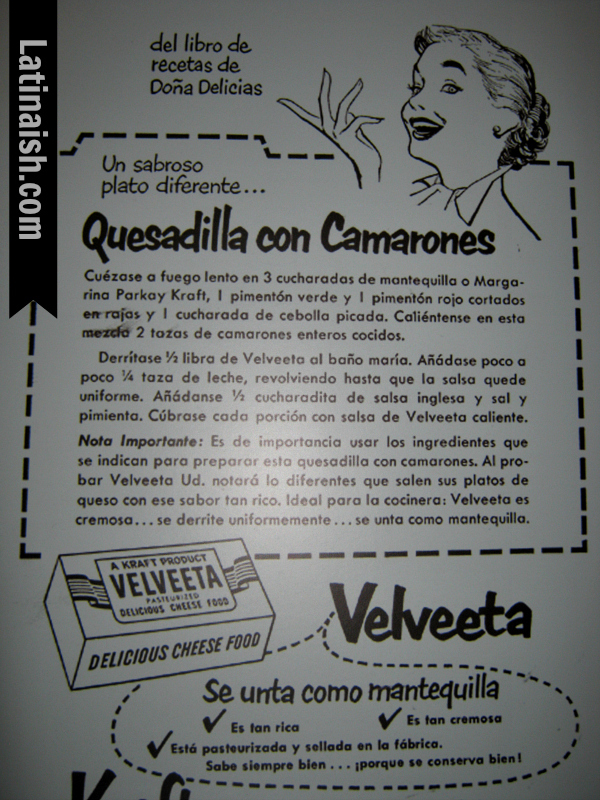 Arias did freelance work for various brands, like this recipe for Velveeta. Am I the only one who wants to try the Quesadilla con Camarones recipe? 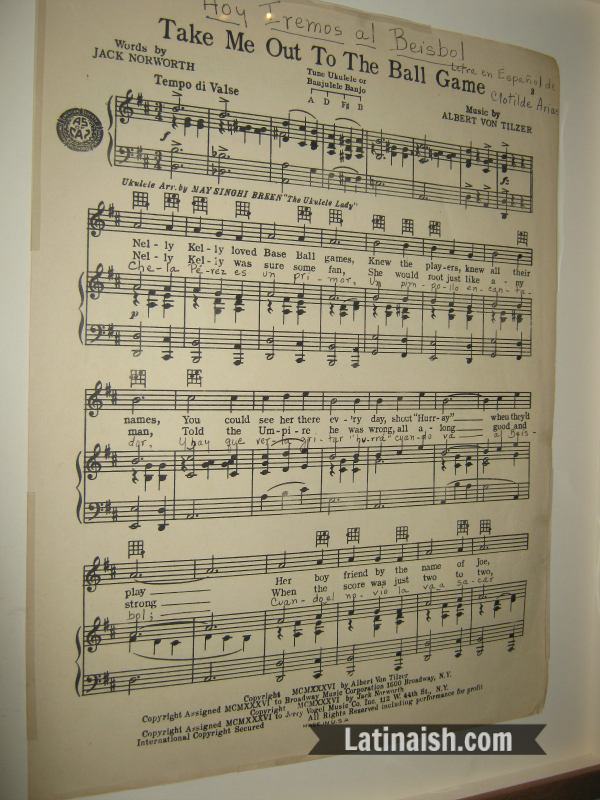 … Arias did all kinds of work for different brands including writing jingles and copy. As a bilingual person with music and writing skills, she was in high demand even during The Great Depression. Some of the brands she worked with included Ford Motor Co., IBM, Coca-Cola, Alka-Seltzer, and Campbell’s Soup. 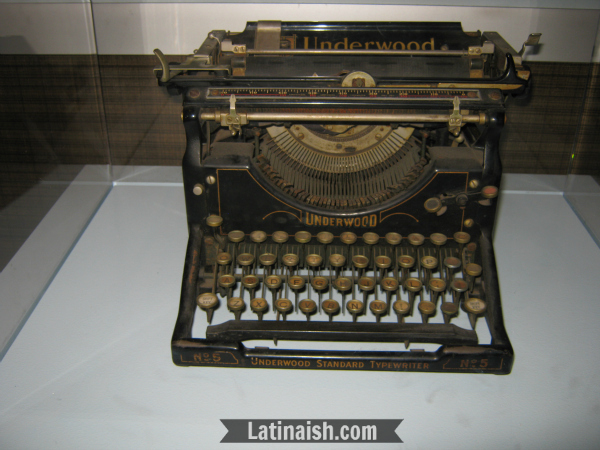 Arias used this Underwood No. 5 typewriter. Arias’ translation of Take Me Out to the Ballgame. 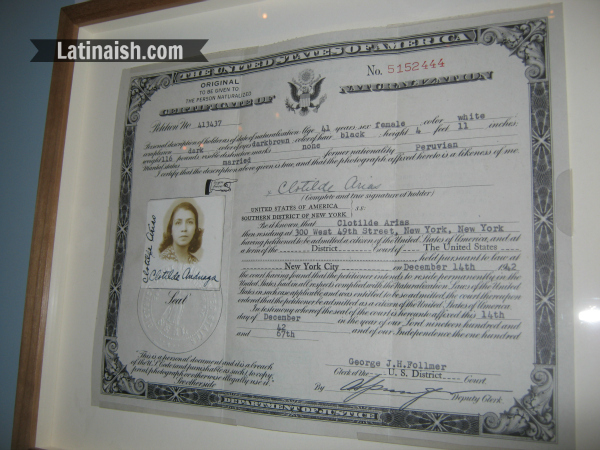 Arias became a naturalized U.S. citizen in 1942. Carlos and I were really surprised by how unchanged the Naturalization Certificate is to this day. Carlos’s certificate looks very similar. Clotilde Arias and these other women were so incredibly ahead of their time. According to the museum exhibit, “Arias was well-known not only for her professional work, but also for her activism and membership in organizations such as the Red Cross, Inter-American Association of Musicians (which she founded), and American Association of Teachers of Spanish. Language became an important ideological vehicle to express the sense of American unity. 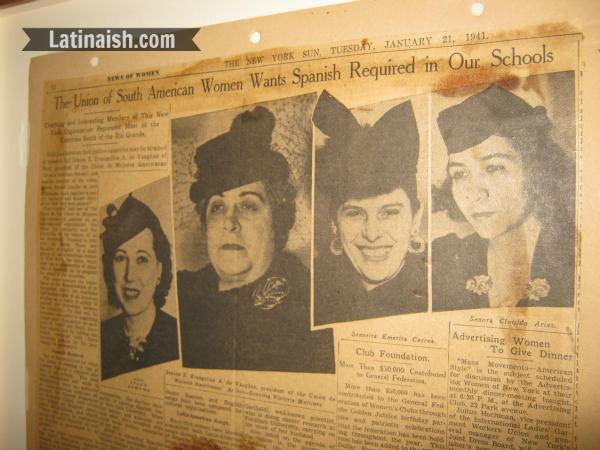 Arias and other members of the Union of South American Women advocated for making Spanish a required subject in all U.S. schools.” … And yet bilingualism still isn’t given the priority it deserves in our education system. The debate goes on and our children, as well as our nation, fall behind. What did you find most fascinating about this exhibit and the life of Clotilde Arias? Could you relate to her, too? LOVE this, Tracy! Thank you for sharing her story. Love, love, LOVE. What an amazing legacy! I love the fact that she truly was a multi-tasker way ahead of her time. I also like how her naturlization paper looks exactly the same as it does today. It’s “the more things change, the more they stay the same” scenario. Women are constantly juggling so much. Thank you for taking the time to share her story. I loved that she translated, “take me out to the ball game!” I would have loved to have met her. And it’s very cool that you discovered this bit of history. It fascinates me how much the general public doesn’t know about history in our own country(ies). This is truly beautiful and inspiring. She’s definitely a women I can relate to in so many ways. Amazing that her legacy is in an exhibit waiting for mujeres like you to discover her. I’m definitely intrigued. Thank you for your kind words about my grandmother. Her work was almost lost to time if not for the hard work of her family (especially her granddaughter Michelle Arias) in compiling and archiving her work for future generations. Roger – Thank YOU, Michelle and the rest of the family for sharing your grandmother with us. She’s an amazing person and you all must be incredibly proud of what she achieved and contributed to the nation.